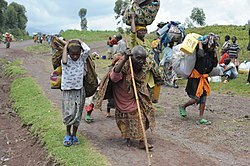 Villagers fleeing the village of Kibati during the 2008 Nord-Kivu conflict in the Democratic Republic of the Congo. Scott Rempell, "Five Grounds," A Refugee Novel. ISBN 1479201723.